Blackjack is simple enough - whoever gets as close to a total of 21 without exceeding it wins. However, with a strategy in the game, it is possible to get rid of all the guesswork involved in winning and thus win more. 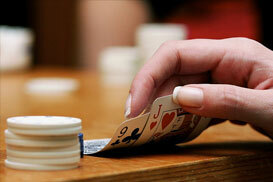 It is easy to learn a blackjack strategy and using it will instantly improve your odds of winning in the game. The smartest way to start would be with the basic strategy below. After mastering it, you can then choose to study other strategy charts, which will help you win even more money. Every decision that you make within these steps should depend on the dealer up-card's value. If he has a 6 or below, keep hitting until you at least get a 12. Stop after you get 12 or up. Double down if you have a card total of 11 or 10 in the beginning and if your dealer has 9 or below. Double down refers to doubling the initial wager after getting your cards. By choosing this option, however, you will only be able to hit one more time. Always split 8s and Aces. Never split other pairs. Splitting pairs refers to splitting your first pair of cards into separate hands. These can then be played as completely individual hands afterwards.